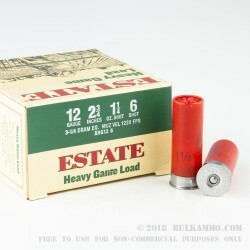 This 12 Gauge shell from Estate Cartridge’s Heavy Game Load line of ammunition is loaded with 1 ¼ ounces of #6 shot. 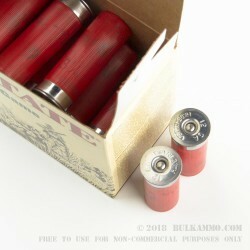 The .11” diameter pellets fall squarely in the middle of the range of sizes that birdshot offers, making it versatile. A blast of #6 can take reliably down dove, grouse, pheasant, squirrel, rabbit, and even a turkey if you place it in its head or neck. Competitive and recreational shooters alike also favor this shot size. What you get from #6 is really what you make of it. 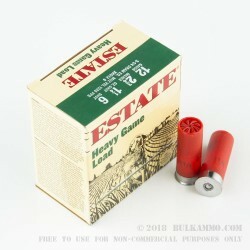 Estate Cartridge specializes in offering high quality cartridges without a high price. 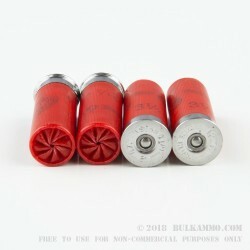 You’ll be certain to approve of these affordable shells’ reliable and uniform primers, even patterning wads, strong plastic hulls, and tightly crimped ends however you intend to use them, whether that might be taking care of Thanksgiving dinner or just thoroughly wrecking some old bottles in your backyard.